Wondrous Kitchen & Bathroom produces high quality, stunning style and functionality custom built vanities that can greatly improve the looks of your bathroom and suit your needs. Vanities can be the heart and the main attraction point of a bathroom and are really important to have it reflect your personality while also suiting your needs. Our craftsmen can create custom built vanities that would suit any tastes. Whether your style is traditional, country, contemporary or anything in between, we will have something to match your preference. If you are looking for something of large proportions or something more compact that still allows for excellent storage, we will have something to suit your needs. If you are really interested in something glamorous, sophisticated, intricate lines or something more simple but elegant and clean lines, we will still have it. We can create any size vanities, wood or painted, with any finishing details that would match your style and fit perfectly in your bathroom. Wondrous Kitchen & Bathroom manufactures custom built vanities Sydney or bathroom and bathroom cabinets, to fit your space, your style and your needs. If you are building or remodeling your bathroom, you should carefully consider having the vanities and cabinets that would best reflect the style you want for your bathroom, as they are an important part of any bathroom design. If you want to stand out and have something different, not one of the pre-made vanities that all seem to have the same style, then you should consider having a vanity tailored especially for your bathroom and your taste. 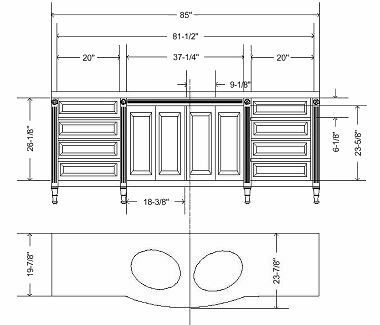 We can create vanities that would fit perfectly in the space you have allocated for it and give them the design you wish for. With us you wouldn’t have to worry about having a vanity that wouldn’t really fit in your place and having to make different adjustments that will involve additional costs and stress, or having to choose a design you don’t love but it will be closer to what you want. With us, you can get exactly what you want with no other adjustments needed, the right size and right design. We will also design and construct your cabinets and vanities mindful of your budget, so you will not need any more investments. Wondrous Kitchen & Bathroom designs and builds vanities and cabinets and also have installation services that will perfectly fit the vanities in their right place. Even if you have the vanity you want it can be time and energy consuming to properly install. Plus sometimes things can go wrong and you might also face new expenses as a consequence. Our specialists will deliver and install your vanities so you would just be able to enjoy them straight away. Wondrous Kitchens and Bathroom skill set goes much further than Kitchen and bathroom Renovations to include a wide range of custom-made joinery services. Whether you need custom-made linen cabinet, bookshelf, TV unit, under stairs cabinet, study room/office or smart garage storage solutions, definitely we can help; simply call us to discuss your requirements and for FREE estimation and advice. For more information about our services, and FREE quotes, please contact us at 0416 565 455 or 1800 779 603.